We are at the end of our discussion on the levels of awareness of parent of young children with disabilities. We have explored the ostrich phase – a time when a parent has a lack of awareness about disabilities and may not recognize the characteristics of a disability displayed by his or her child. Additionally, we have examined the phase of special designation – the stage at which parents have, through some transformational experience, recognized that their child indeed has a disability, and will require some additional assistance from a service provider to maximize his or her personal potential. Last month, we reviewed the normalization phase when a parent minimizes differences between the child and his or her typically developing classmates and siblings. Today, we are going to explore a parent’s fourth and final level of awareness – Self-Actualization. In this level of awareness, a parent fully recognizes that his or her child with disabilities need supports. Not only does a parent at this level recognize the need for support, but by this time in a parent’s journey, based on the experience of raising and loving the child, the parent has his or her own perspectives on how these needs should be met. During the time of parenting their child with disabilities, the parent has developed an expertise on a subject – his or her child. Parents of children with disabilities have been described as practical scientists, and co-therapists, who take an active role in educating and raising their children while becoming skilled at selecting appropriate interventions. Parents may not have the fancy words that you as an early intervention professional have based on your knowledge of the content. However, they are doing some of the same things that you are doing in your practice at home. The interventions just look a little differently. A self-actualized parent is ready to exercise his or her role as your partner in moving the child’s growth and development forward. And at this point of development, the parent is incapable of being a silent parent. The self-actualized parent is vocal and active. At times, the strong opinion and confidence that develop during and after the self-actualization phase can be met with a bit of resistance from service providers. However, this new found parental authority, when discussing the needs of the child, should be met with a listening ear and an open heart. The parent is now fully capable of exercising and expressing expertise regarding who his or her child is and what the child needs. The Magic is About to Happen! How can you achieve that goal? By listening to your partner – the parent. The phase of self-actualization is a reflective space. The parent has had the opportunity to think about the child, think about his or her parenting, think about what he or she feels will be the best way forward for the child and family. The self-actualized parent is ready and fully expects to be your partner. However, this partnership will require a respectful reciprocal relationship between you and the parent. You can’t be in partnership if, as the service provider, you walk into the relationship and take the lead. That’s not a partnership. The parent is asked to follow your lead in that situation. However, if the relationship is approached with the understanding that you are the expert on the professional knowledge and the parent is the expert on the child and how the disability manifests itself in the child, you can begin to respect and acknowledge the parent as a true partner. Also, it is critical to remember that, as early interventionists, the goal is to improve children’s outcome. Therefore, you want to empower and enable parents, because no matter how great of a service provider you are or how much you love a child, your time with that child will expire. Parents and caregivers are forever. So, take this time to strengthen your partner. That self-actualized parent is primed to receive the knowledge you have to give. However, self-actualized parents require and expect that you recognize and accept the knowledge and input they have to offer, as well. This Child is Their LIFE! These parents have now fully owned their role as parents of a child with disabilities. They are no longer in a state of not knowing. They are no longer looking for someone to “fix” their child. They are no longer comparing their child to other children. They just see their most precious child – uniquely different, but not less than. Unfortunately, as professionals who works with young children and their families, you may not witness a parent move through all of these levels of awareness during your time with a family. However, you must trust the process, not rush the process. And remember a parent’s time of being a parent is 22 years +. And just like the children you serve, parents too take time to develop. When you commit the time to truly partnering with a parent and assist in that parent’s development as a parent of a child with disabilities, your legacy lives on in that family forever. You become the gift that keeps on giving. So, be the gift that keeps on giving! We’re counting on YOU! Have you had the opportunity to partner with a parent who you believed reach the self-actualization phase of awareness? How did that experience compare to partnering with parent in the ostrich, special designation, or normalization phases? El is an educator, entrepreneur, author, and PhD candidate specializing in Early Childhood Education/Early Childhood Special Education at George Mason University. Prior to leaving the traditional classroom, El served as an Elementary and Early Childhood Educator in the United States, Japan, and South Korea. 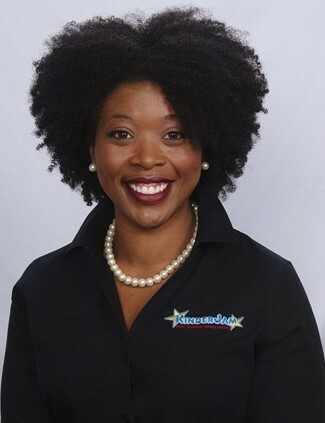 She is the founder of KinderJam, an Early Childhood Education care, enrichment, and training agency. Above all, El is the proud mother of an 11-year-old son on the autism spectrum, affectionately known as SuperDuperKid (SDK). El can be reached at elbrown@kinderjam.com. Glad you liked it, Lynne!